They came by the hundreds to Chinatown Sunday to hear in English, in Cantonese and in the Chinese dialect of Sze Yup how Vancouver’s civic government was truly sorry for the historical discrimination that previous city councils caused and perpetuated against the Chinese community. 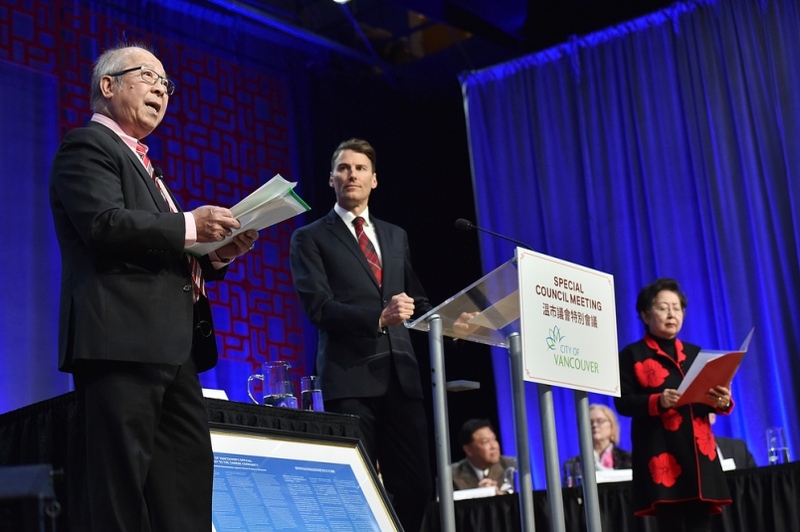 The long-awaited apology was delivered by Mayor Gregor Robertson (in English) and former city councillors Maggie Ip (in Cantonese) and Bill Yee (in Sze Yup) at the Chinese Cultural Centre of Greater Vancouver on Pender Street, where more than 500 people sat and stood to witness the historic event. Outside, dozens more stopped in the streets to watch the proceedings broadcast on large video screens positioned near the Keefer Memorial Square, where a monument stands in recognition of the contribution Chinese war veterans and railway workers made to Canada.